Need to shake up your family-friendly recipes a little? Are you looking for a dish that's quick enough to fix on auto-pilot before dashing out of the house in the morning? We've got it right here. 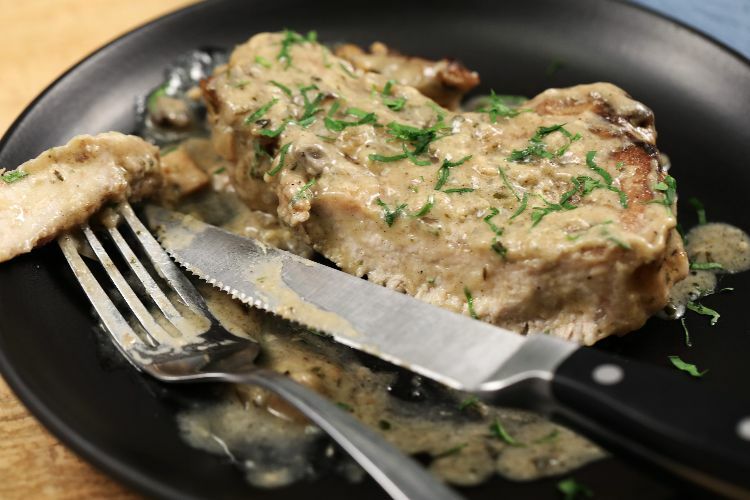 Just a few simple cupboard ingredients and a clutch of decent pork chops, and you have a fabulously easy dish of smothered pork chops to come home to. With a crisp green salad alongside, we think this dish is special enough to serve to friends for an informal supper party! Season pork chops with salt and pepper. Coat in flour; tap off the excess. Put a sauté pan on high heat. Add in oil. When oil becomes hot, add in pork chops and brown both sides. Be sure not to overcrowd the pan as this will steam the pork chops rather than browning them. Set aside. Add in onions and garlic. If you need to add a little oil to the pan, go ahead and do so. Sauté for 3-5 minutes on medium low until onions are tender. When onions are tender, add in chicken broth to deglaze the pan. When all the bits at the bottom of the pan have lifted, turn off heat. 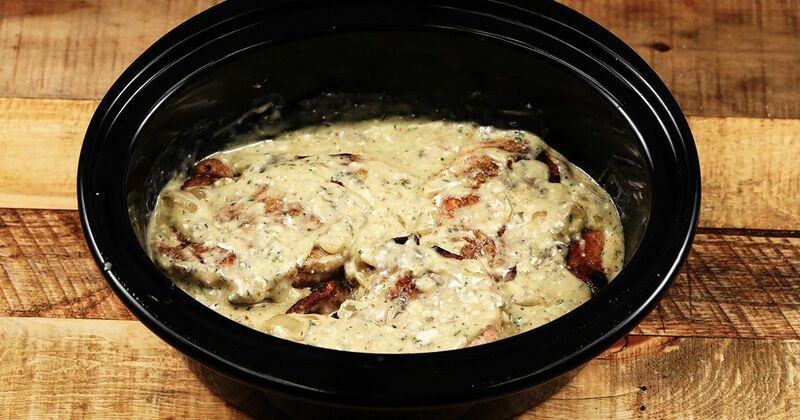 Pour into a 6-quart slow cooker. Add in mushroom soup, chicken soup, thyme, parsley, onion, and garlic. Mix well. Add in pork chops, pushing them into the soup. Allow to cook for 3 hours on low. Optionally, garnish with fresh parsley. Serve! For a great midweek meal, serve either one of these great recipes with mashed potatoes or rice and a green steamed vegetable on the side, and enjoy! If a trip to your favorite Thai restaurant just isn't in the cards this week, you can certainly create a delicious slow cooker peanut pork stew right at home. Pork and fruit (particularly apples) are a really great combination; the sweet tartness cuts through the porky-richness like a dream. This hearty alternative is a delicious way to break the monotony of beef stew.